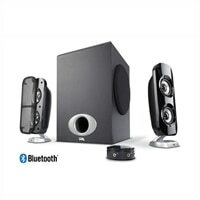 CA-3858BT - 80W Peak Powered Speaker System with Control Pod and BluetoothThe CA-3858BT Bluetooth speaker system is a powerful audio choice, delivering rich thunderous sound, and offering an excellent solution for wirelessly connecting to all of your mobile devices. Perfect for listening to your favorite movies, music, games, and more. From nearly any direct plug-in audio source to wireless connections via Bluetooth, this speaker system is ideal for TVs, laptops, towers, tablets, smartphones, iPods, MP3 players, and other portable audio sources. The CA-3858BT Bluetooth speaker system is a powerful audio choice, delivering rich thunderous sound, and offering an excellent solution for wirelessly connecting to all of your mobile devices. Perfect for listening to your favorite movies, music, games, and more. From nearly any direct plug-in audio source to wireless connections via Bluetooth, this speaker system is ideal for TVs, laptops, towers, tablets, smartphones, iPods, MP3 players, and other portable audio sources.